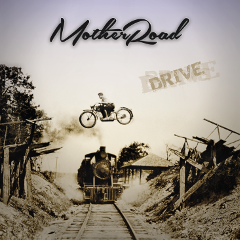 Blues Hard Rock band MOTHER ROAD will release their first full-length album "Drive" through their own label Road Songs with the distributor AOR Heaven on May 23rd 2014. The band was founded in 2011 by the brainchild of Austin, TX (USA) based rock singer Keith Slack and Berlin (Germany) based guitarist Chris Lyne. Named after “The Mother Road”, another name for the US’ legendary, historic Route 66 highway, this international band is impressively transferring the vintage sounds and the trademarks in this genre into the new decade. Chris Lyne is well known for his astonishing work with his previous group Soul Doctor, and Keith Slack acted as frontman of the bands Steelhouse Lane and Michael Schenker Group (MSG), and also his own blues-influenced Hard Rock band Mudpie. You can see that Slack and Lyne establishing a good chemistry between them based on mutual musical influences and it reflecting into their music on this album. Amazing mix !!! Original Sound !! This is.going to be off the charts !! !